If you’re a parent, you’re probably akin to the daily stresses of raising kids. You know the drill. Packing the lunchbox with nut-free “peanut butter” and banana sandwiches with no crust, cut in triangles and chilled at just the right temperature. You are mom or dad of the year if you’ve made it through the day without a lunchtime tantrum. But there are many long-term stresses that parents worry about too. Like when to give kids their first smartphone or tablet. If you haven’t given the topic much thought, consider these findings from a recent study conducted by the Census Bureau. It found that children who spend seven or more hours a day on screens are more than twice as likely to struggle with depression or anxiety than those who use screens for just an hour a day. Parents aren’t setting out to intentionally harm their kids. Screen time is often a matter of convenience and respite. It can easily become routine to grab for the phone or tablet when your kids need to be entertained. Getting out of that habit takes a little bit of creativity and thought, but when you’re exhausted at the end of the day, your creativity tank might be empty. If you’re looking for some ways to replace screen time hours, here are a few game night activities that don’t include electronics. Personally tested by the extended Porchlight Homes family, we’re sure your kids will love them. Having dinner together as a family is the perfect setting to get your kids to open up and talk about their days. Depending on their ages, it might not come easy. One idea is to start with a game or question. You’d be surprised how a simple game like “I Spy” can lead to chattering kids. Consider these icebreakers. Another game perfect for the dinner table is the manners game. Teaching kids to chew with their mouth closed and use a napkin can be made into a game. Use a piggy stuffed animal or figurine and set it in the middle of the table. Let everyone know the rules (manners). Whoever is caught breaking the rules will get a visit from the piggy. At the end of dinner, the person with piggy in front of them has to take the dishes to the sink. Many board games that today’s parents grew up with are making a comeback. Classics like Chutes and Ladders, Candy Land, and Uno are now considered cool and retro. Hooray! 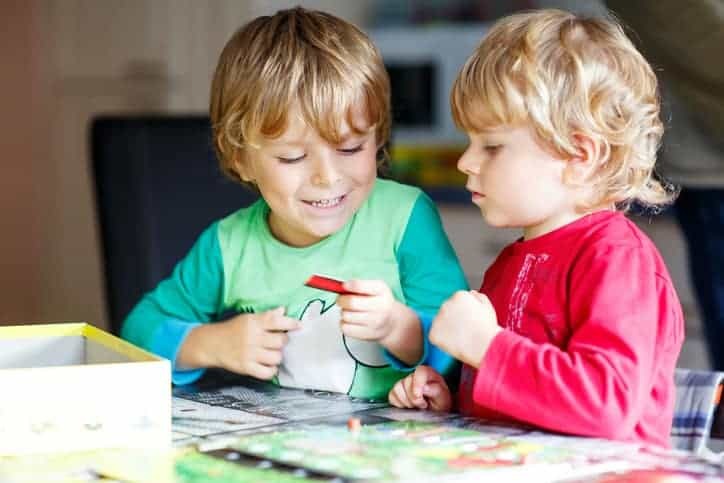 Challenge your kids to a board game marathon. Winner gets the satisfaction of a game well played. Keep track of the winners every night to encourage more play. Check out these card and board game favorites. The bath or shower can be a great time for a fun activity, especially for younger kids. There’s nothing more calming than drawing letters on your little one’s back. Ask them to guess the word you’re writing. It’s fun, silly, and the perfect way to wind down before bed. Create a bedtime scavenger hunt for older kids. Each step in their bedtime routine leads to the next clue until it’s time to read a book and go to bed. The point of many of these screen-free activities and games is to spend engaging family time with your kids. We’ve found that these games are just the beginning of a fun night at home. A game or activity with your kids leads to laughter, conversations, and hopefully a good night’s sleep. It’s a win for everyone! At Porchlight Homes, we bring your dream home to life with thoughtful craftsmanship and the personal care of family. For more information about our communities, reach out to us online or stop by for a tour.